You may feel uncomfortable around your abdomen, lower back, thighs and legs. About half of women who menstruate have abdominal cramps (also called dysmenorrhea) for initial 1-3 days, each month. Women have been dealing with abdominal pains of varying severity since many centuries but nobody talks about it. Before we talk about natural ways to relieve period cramps, it is important to understand the cause of cramps. Menstrual cramps are caused by the contraction in the uterus when it is trying to sheds the lining and the blood gets coagulated. If the uterus contracts very strongly, it can press against the nearby blood vessels, thereby cutting off the supply of oxygen to the muscle tissues in the uterus which causes the pain. Sometimes, women take the painkillers to get rid of period pain which is a very bad choice in actual. You read it right – Avoid painkillers during menstrual cramps. Research has shown that prolonged use of painkillers may lead to serious side effects like bleeding disorders, kidney failure and liver damage. “People pop over-the-counter pills because of severe and long-lasting pain during menstruation without realizing its implications. Instead of being diagnosed with the real problem, which may be endometriosis, they end up with kidney failure because of the pills.” by Dr Kamini Rao, medical director of Bangalore Assisted Contraception Centre to the reporter of Times of India. 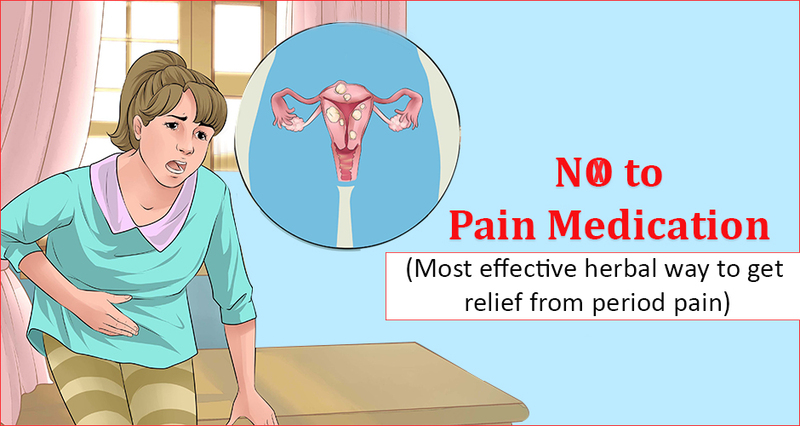 There are some natural ways to manage painful periods which might not stop the pain completely but are super effective in reducing the pain without any side-effects. The hot water bottle technique is useful and an effective way in easing menstrual pain. Applying heat to your abdomen and lower back, heat helps to relax tight muscles and improves blood flow to tissues. 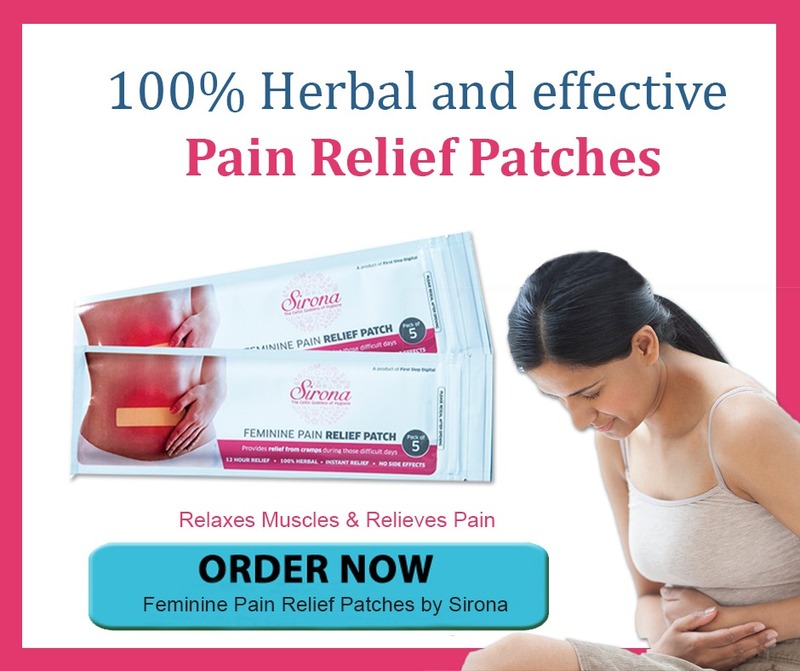 Sirona, the first and 100% herbal pain relief patches in India which are completely safe and help to get relief during cramps. Sirona Pain Relief Patch is recommended for pain in the lower abdomen or lower back and during cramps. How Do Sirona Pain Relief Patches work? Sirona Pain Relief Patch works on the simple formula, it relaxes the muscle and provides the continuous relief from pain and muscle cramps. It is enriched with essential oils like eucalyptus and menthol which provide instant relief from pain, gastrointestinal difficulties, and inflammation. The menthol in the patches dilates the blood vessels and brings about a cooling effect. The eucalyptus oil possesses analgesic and anti-inflammatory properties, which help to soothe the pain and the inflammation. Sirona patch provides the instant relief from cramps during periods and the effect lasts for 12 hours. 100% herbal with no side-effects. Reduce leg cramps and pain in calf muscles, eases the backache. Really easy to use and it sticks properly to body so you can worn discreetly under clothing. Ideal for use in travels, office or any party. Wear Sirona patch to social gatherings or office under your clothes and have a comfortable, pain-free period. Sirona pain relief patches are recommended to use for lower abdomen cramps, lower back pain, pain in calf muscles and legs. How to Apply Sirona Pain Relief Patch? Dry the application area with a clean and dry washcloth before use. Take out the patch from the packet, peel off the transparent protective liner and place the patch evenly to the affected area. One to two patches can be applied in one day or as directed by the physician. How to Remove Sirona Pain Relief Patch after use? To take off the patch, sprinkle a few drops of warm water over it. Slowly peel off the patch and dispose off in the bin after use. Take care while removing the patch if it is applied to hairy skin. Note: In case you have acute pain and don’t get much relief even after applying the patches, you must consult a doctor so that he can further investigate the underlying cause of the pain. Chamomile tea is packed with the goodness of anti-inflammatory properties that help ease menstrual pain and cramps. Alternatively, you can also try other soothing teas like ginger tea, peppermint tea, and fennel tea. Make sure it’s caffeine & gluten free. Subtracting fats and adding vegetables to your diet may help ease monthly cramps. A low-fat diet actually cuts overall levels of inflammation in the body. Switch from saturated fats found in animal products to unsaturated fats found in nuts and olive oil. If you’re consuming dairy, opt for low-fat or fat-free products. Consume magnesium-rich foods like pumpkin seeds and bananas and get your daily requirement of fiber through leafy green vegetables. Magnesium will help decrease water retention during periods, fiber will aid in eliminating bloating, gas and puffiness. Drinking sufficient water prevent your body from water retention and stop painful bloating. Drinking hot or warm water give relaxation from period cramps by increasing the blood flow and relaxing the cramped muscles. So, you must keep yourself hydrated and include the water content foods in the diet like celery, cucumber, green pepper, melons, iceberg lettuce and spinach. Allow your body to go through the natural cycle without medications. It is important to listen to your body and find out the best solution for you. There is no universal solution for all the women having periods pain. When it comes to relieving menstrual pain and cramps, one technique cannot be solely relied upon It is suggested to use a combination of two or more techniques to see the benefits over a period of time. For instant relief, use Sirona pain-relief patches along with a proper diet and warm teas and water. In case of unbearable pain or blood loss, consult your physician immediately. 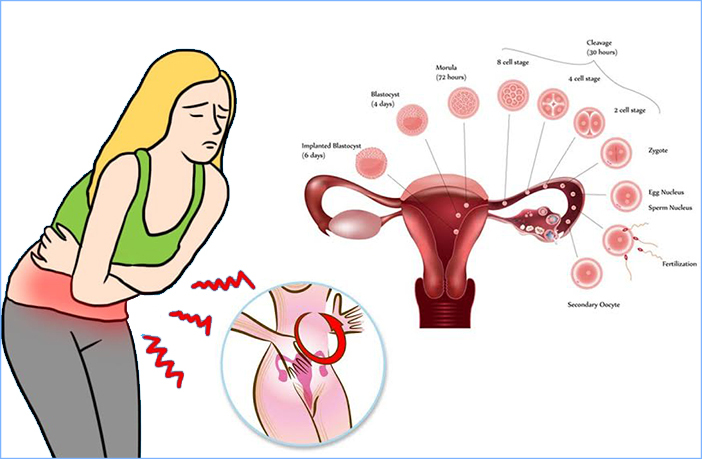 Do you experience severe menstrual cramps during your periods? What pain relief methods do you use? Share below!